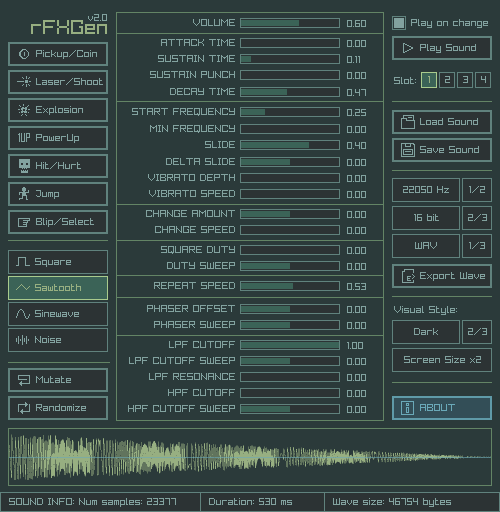 A simple and easy-to-use fx sounds generator, based on the amazing sfxr. 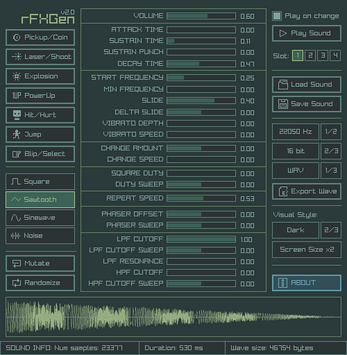 rFXGen comes in two flavours: ZERO (free version) and ONE (low-cost version). 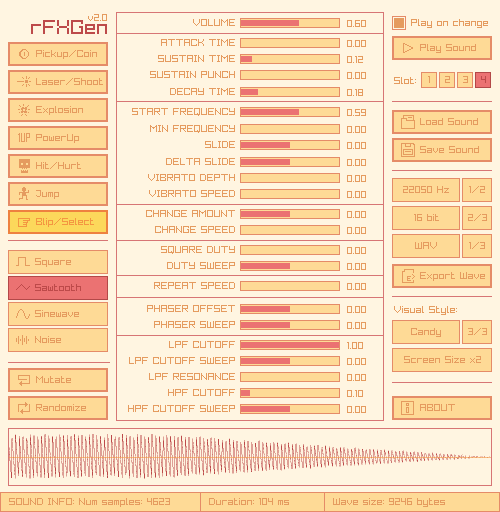 Open the tools and use buttons/slider to generate sounds in real-time for your games. 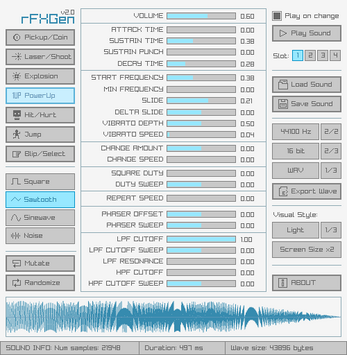 Sounds could be saved as .rfx (sound generation parameters) and also exported to .wav as sample data, defining sample formating. 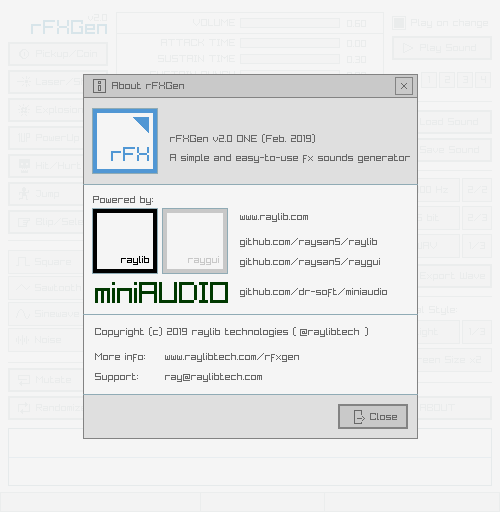 rFXGen ONE also allows exporting sounds as .raw sample data and as a plain code byte array (.h). Do you like this tool? Do you need any specific feature to be added? Maybe a custom export format? Maybe a custom gui theme? Or maybe a version for Linux, OSX, Android, Raspberry Pi or HTML5? Just get in touch! 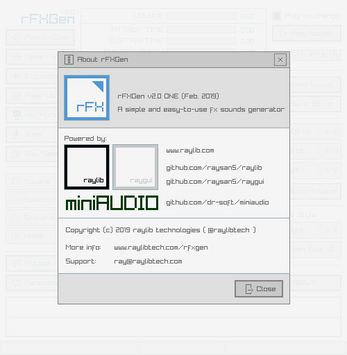 rFXGen is open source software. 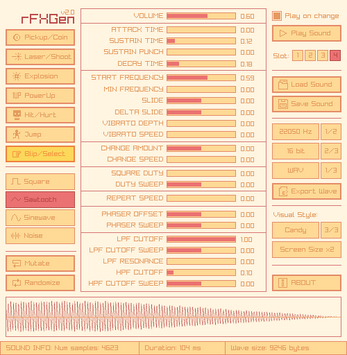 rFXGen source code is licensed under an unmodified zlib/libpng license. rFXGen ZERO is free and rFXGen ONE is low-cost, with the addition of some useful features. In any case, consider it as a small donation to help the author keep working on software for games development. Can any sounds generated be exported? yes, you should be able to export generated sounds as .wav just pressing the Export button. Did you try it?